As more information comes out on Russian influence operations in the United States, evidence is building that the dominant anti-Trump movement, the self-described “resistance,” has been used by Russia to stoke division and undermine the White House. After Trump’s electoral victory, Russian cyber operations began focusing on “fomenting discord about the validity of [Trump’s] election,” Facebook general counsel Colin Stretch told a Senate Judiciary panel on Tuesday. Sean Edgett, general counsel for Twitter, offered a similar assessment. “Join us in the streets! Stop Trump and his bigoted agenda!” a Facebook event for the protest read. The Guardian reported that 10,000 people showed up at the anti-Trump protest. Left-wing filmmaker Michael Moore was among those duped into joining the Russian protest. I’m in the middle of thousands -tens of thousands?- of American voters outside Trump Tower demanding he step aside. He got the least votes. Russian operatives organized other anti-Trump protests, BuzzFeed reported, including a pair of anti-Trump protests in Charlotte, North Carolina. While promoting the anti-Trump protests in Charlotte, the Russian operatives falsely claimed that the fact that Hillary Clinton received more total votes than Trump — which is meaningless in the Electoral College system established by the Constitution — made Trump an illegitimate president. California Rep. Maxine Waters, for example, began calling for Trump’s impeachment before he ever took office and has continuously pushed for impeachment ever since. “I don’t see this president-elect as a legitimate president,” Georgia Rep. John Lewis said in January. Lewis claimed that Russian meddling made Trump’s victory illegitimate. At that same time, we now know, Russian operatives were pushing similar messaging meant to undermine Trump’s legitimacy. Recent reporting has shown that Russia’s attempts to inflame America’s political divisions included a concerted effort to promote identity politics, which currently dominates the American left wing. 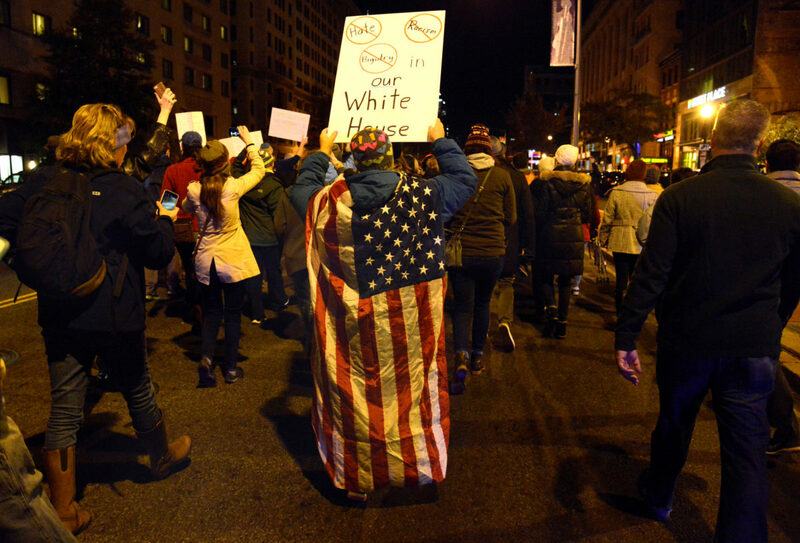 Several Russian accounts posed as a racial activist groups similar to Black Lives Matter. 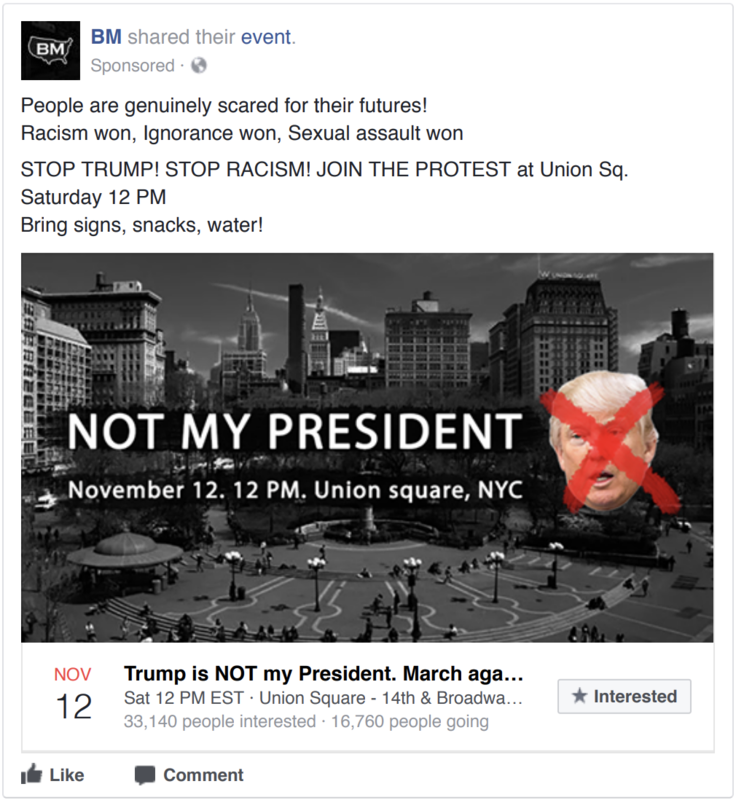 One of those pages, Black Matters, organized the massive anti-Trump protest in New York City on Nov. 12, four days after Trump won the election. Another page, Blacktivist, had a bigger Facebook reach than the official Black Lives Matter Facebook account by the time it was shut down. Blacktivist accounts frequently stoked racial outrage about police shootings and mass incarceration of black men, CNN reported. Yet another Russian account promoted a militant form of feminism, similar to the kind pushed by Women’s March organizers. The Russian operatives behind the account even fooled Women’s March organizers into sharing their content on Facebook.